Wait for it…. 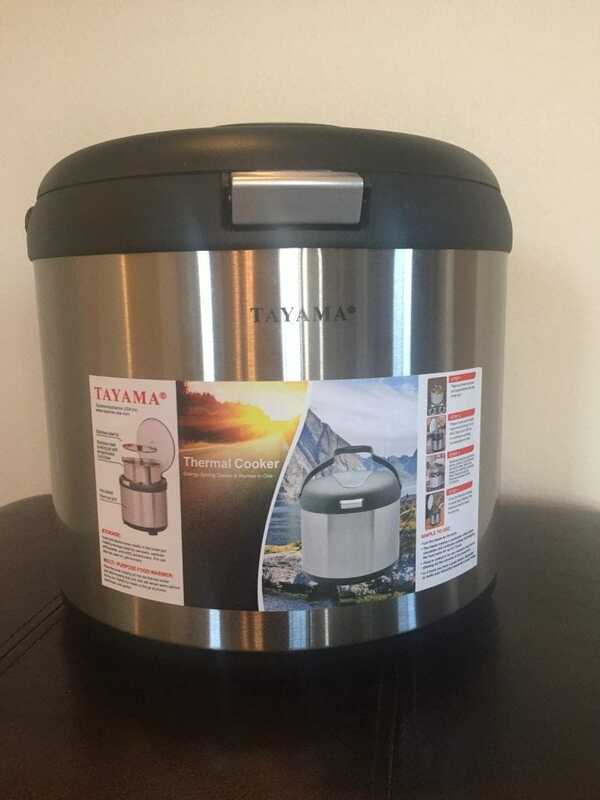 a thermal cooker! 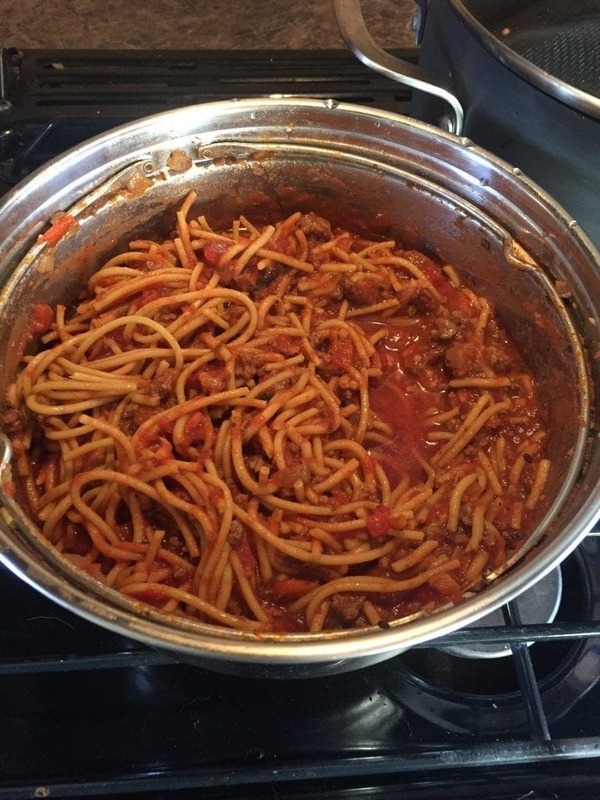 Looking back over the past year there were clues a thermal cooker was needed in our lives! Technically I didn’t even know what a thermal cooker was a year ago. It’s been the answer to so many questions. It has added value and comfort to our lives. Sounds a little crazy, right? It is! When an object changes your life, you want to share it with everyone. You want everyone to have one and that’s why I’m writing this today. Want the one we bought? from Amazon for $69.99. You can click the amazon link to learn more about it. If you decide to purchase, please order from our link to help support our blog. What is a thermal cooker? A thermal cooker is a device that uses thermal insulation to retain heat and cook food without electricity or fuel. The idea is similar to what a vacuum insulated water bottle does for your ice and drink. You know, those expensive water bottles that have been popular the last few years. It is also similar to a crockpot where you cook food over several hours. The big difference is the thermal cooker doesn’t use electricity over the course of those hours, but you do need a heat source for the initial heating. 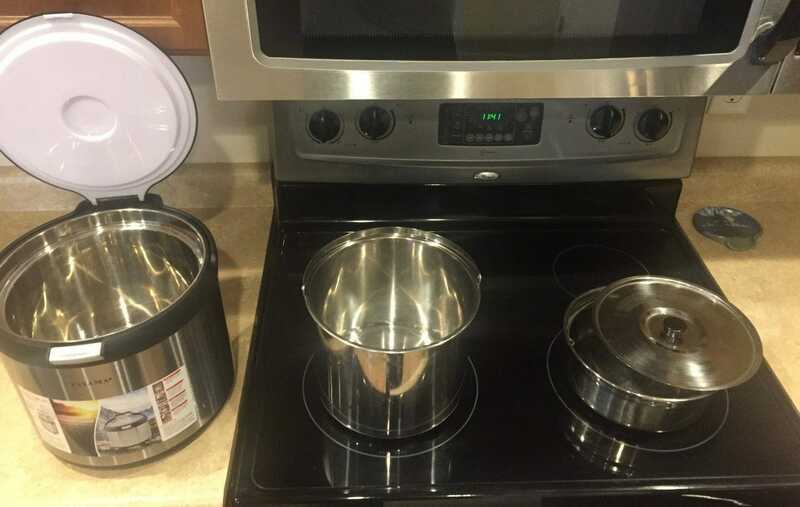 My thermal cooker includes 4 pieces; large pot, small pot, lid, and insulated container. The large pot (or combination of large and small) is filled with food and liquid. It is then heated outside of the insulated container. This is where you need the heat source; gas or electric stove, open fire, grill, etc. After the food is heated to a certain temperature, usually taking 10-20 minutes. Then the pot is placed in the insulated container and the food cooks for several hours. Portability and saving money is what drew me to the thermal cooker. 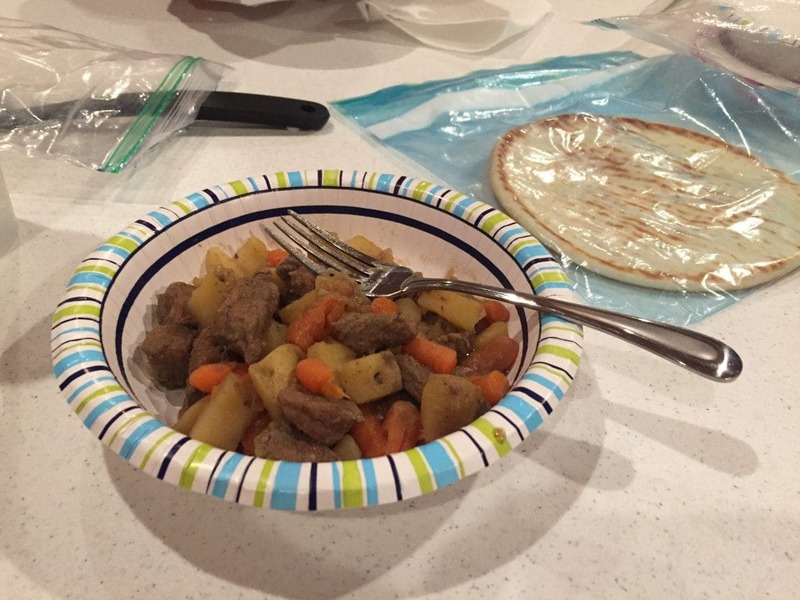 We wanted to find another method for cooking while traveling. 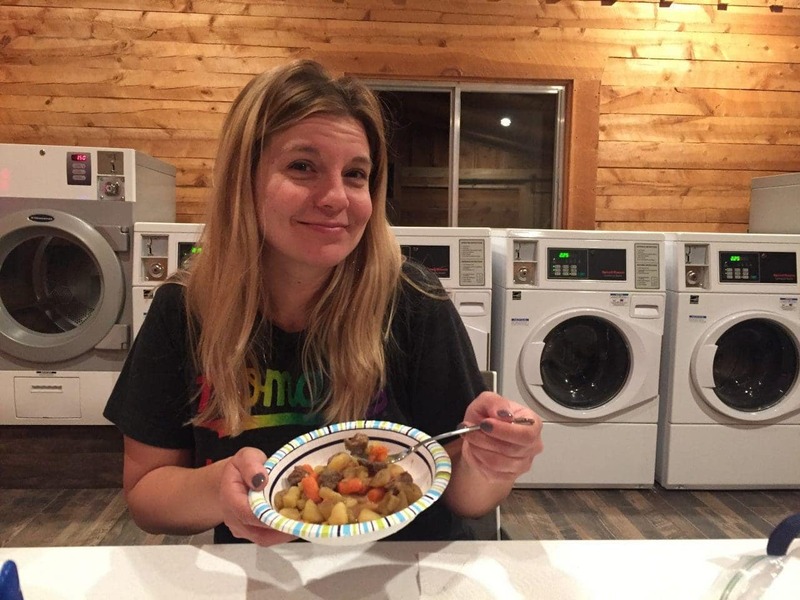 It all started when I intended to use our crockpot during our first long trip in the motorhome and we did for the first week…. until it got so hot that cooking became a real problem. You realize how much heat your appliances give off when in such a small space. 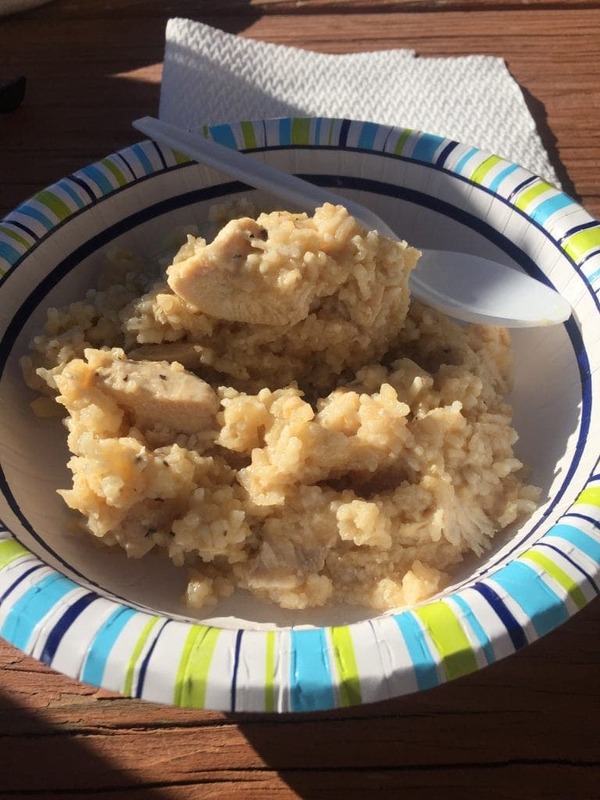 Cooking on the stovetop or using the crockpot just put too much extra heat in the motorhome. We learned that RV air conditioning does have limits. It basically can only cool to about 20 degrees below the outside temperature. When it’s 100 degrees every day, you have to do everything you can to maintain a comfortable indoor temp. Cooking outside on the grill wasn’t a great option either since it was so hot outside. So how did we eat? I did use the crockpot through the night. I’ve actually been doing this since we moved to Utah and Keith’s lunch time is 10:00am in Utah (noon eastern standard time). This way he can have a hot meal without me getting up and cooking lunch right away. This worked in the motorhome and my other go to was cooking dinner in the morning when it was cooler and reheating in the microwave later.
. I actually fretted over the decision for way too long. For some reason I just couldn’t figure out why the Instant Pot was so much better than my crockpot. I know many owners can give me lots of great reasons! The big benefit for the instant pot is speed and that wasn’t really what I was trying to accomplish. What really changed the game was when we began to see other ways for using the thermal cooker. It would be great for skiing and knowing we could use it often and all year long was a big factor. The thing only costs about $70…. We totally over justify some purchases! We can essentially cook at the same time as we’re making a long drive. 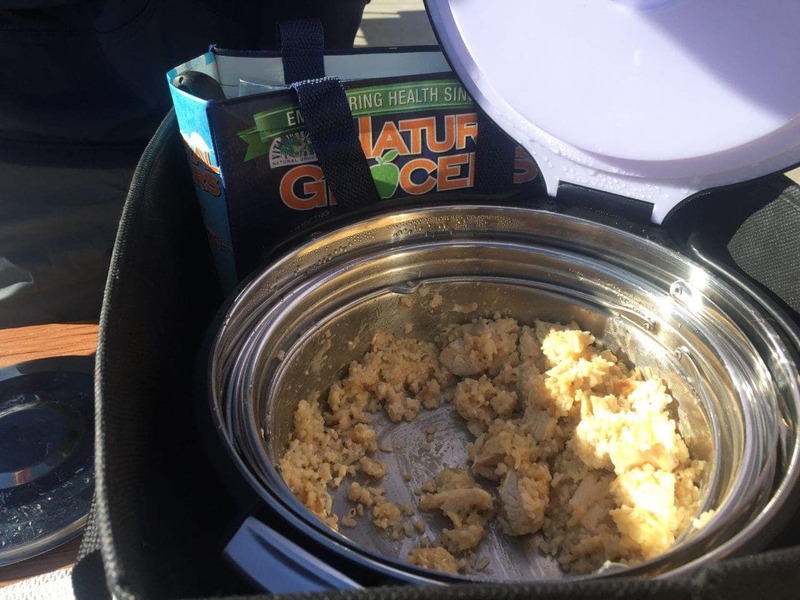 I used it to make a hot meal while traveling in the motorhome on our last trip. We drove all day, set up and it was great to have a hot meal immediately. I also plan to it use while in transit to ski vacations this winter. We have two trips planned and I’ll cook on the drive so we have a homemade option of food (made sure hotel has refrigerator and microwave). I think we used the thermal cooker at least 4 days a week while we were in Panguitch. Since we go on some sort of an adventure most days, we had the option of taking hot food instead of sandwiches. We did have to eat back to the car opposed to on the trail, but it worked really good for us on this trip. We were in Panguitch late Fall so a hot meal was a real treat when arriving back to the jeep after hiking. Similar to adventure days, we are using the cooker for hot meals while skiing. 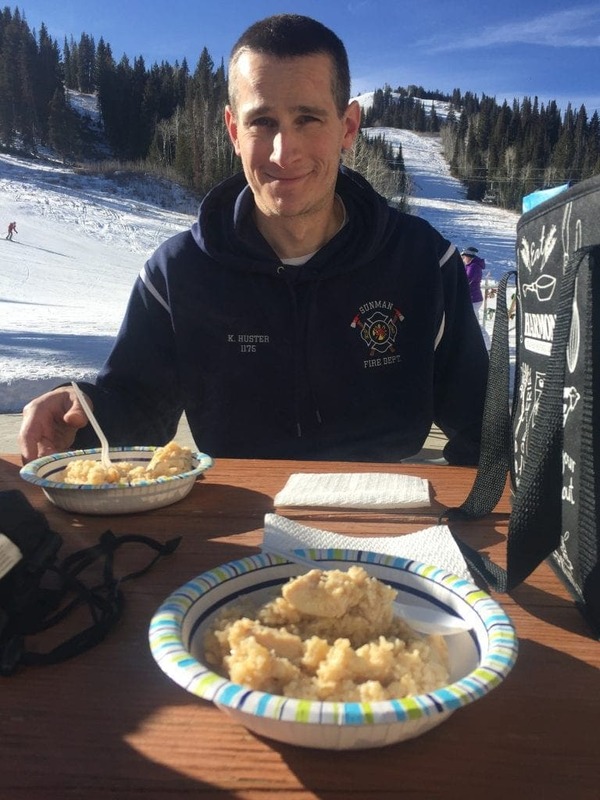 Resort food has its place, but when skiing so often it really gets old and VERY expensive. Taking food with us gives us another option. We skied twice last week and used it both times! I’ve figured out a few meals that work better for certain days than others and keep that in mind when planning. At first I was only using my crockpot recipes, but then realized there’s room for more variety since there are two pots. 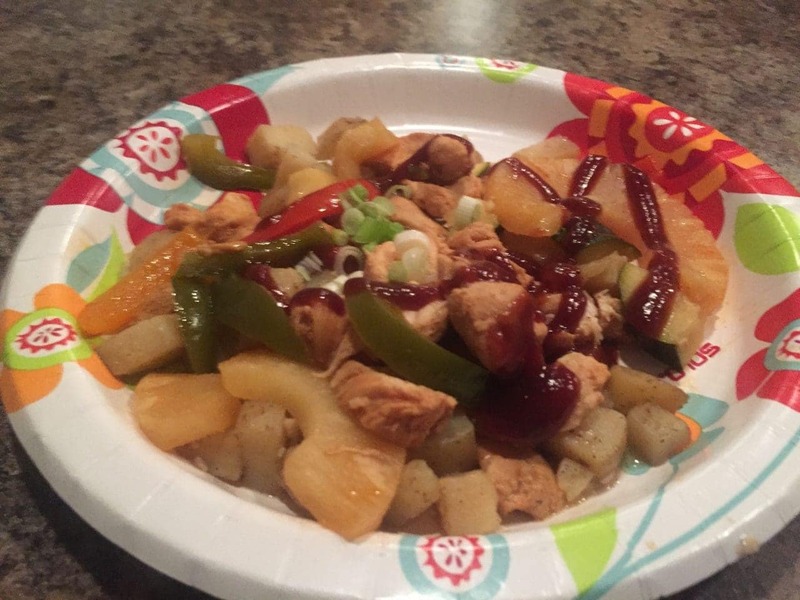 For example I cooked bbq chicken, peppers, onion, and pineapple in the large pot and potatoes in the small pot while on the way to Panguitch. We had that meal a few times. When the potatoes ran out, I cooked rice in the small cooker for another version of the meal. 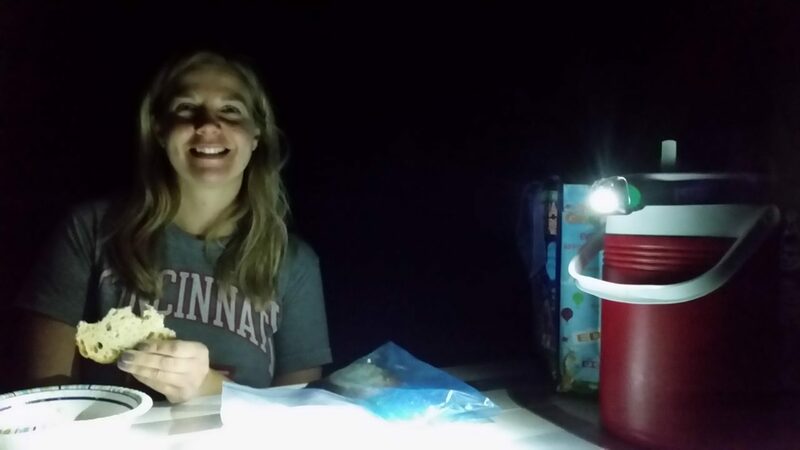 This was super easy for an adventure night. I just reheated the big pot and put rice with hot water from our electric kettle in the small pot and it was cooked perfectly after our hike. Finally there was a little of the chicken mix left and we ate that on pita bread as a sandwich. I’m a little leery about cooking meat in it so I try to keep some extra cooked meat in the freezer. It’s super easy to cook ahead. I can use my crockpot to make large batches of chicken for casseroles or soup recipes. Browned ground beef or turkey is also easy to cook and freeze. If I do cook meat directly in the thermal cooker, I just make sure to spend a few extra minutes cooking it thoroughly before transferring to the insulated case. In a pinch, I have a backup plan to use a pre-cooked rotisserie chicken if available. Sam’s Club and Walmart typically have these for $5.00, typically other grocers are more expensive. You don’t have to always cook the food in the thermal cooker. It can be used just to keep food hot. While out in the motorhome, there were times I used it for cooking and other times where we just needed leftovers kept warm. I imagine I might be using it more for reheating while skiing. 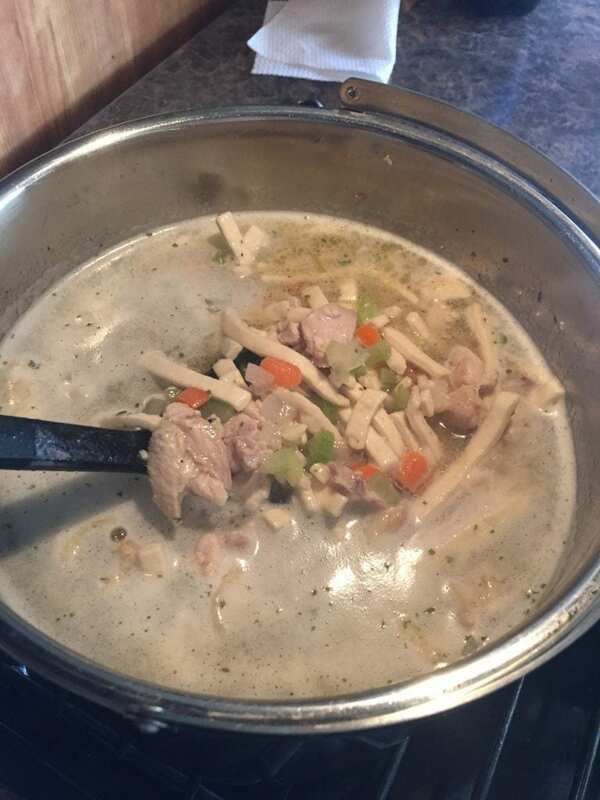 For example, last week I made soup and just reheated it in the thermal cooker for a ski day. This takes much less time, especially when you’re not a morning person and getting up at 6:00am to head to the slopes! 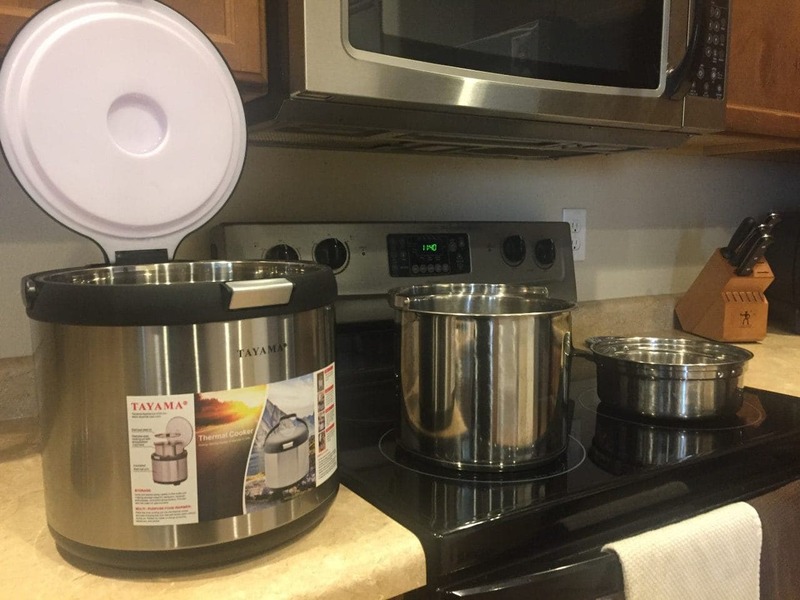 Do you have any experience using a thermal cooker? Do you have any tips to share? What challenges do you have while cooking, at home or while traveling? What small appliances do you use for cooking? Have any favorite recipes to share?